John Gelasi is back with six more commerical, fun card routines featuring the 4 kings. Fit for Kings, Too is the sequel to John's first ever release, Fit for Kings . Once again, all of these effects are easy and hard hitting, yet all are done with just a regular deck of cards. Uproarious: Four Jokers change into four kings one-by-one. One king is set aside, and the other kings are transformed into the cards to complete a royal flush. Hofzinser with a Twist: Four kings and a selected card. The king of the same suit as the selection reverses twice, then switches places with the selection under impossible conditions. Almost Perfect: The performer finds that he can cut to three of the four aces, but finds a king instead when cutting to the last ace. Not a problem, as four cards are then produced from the deck: the missing ace, plus... the other three aces! The three "aces" from before are shown to have changed into the other kings. Funny Assembly: Two Jokers and four kings switch places in a short and sweet assembly-like routine. Walton-ing Around: A mixed packet of red and black cards reveals a selection in two phases. 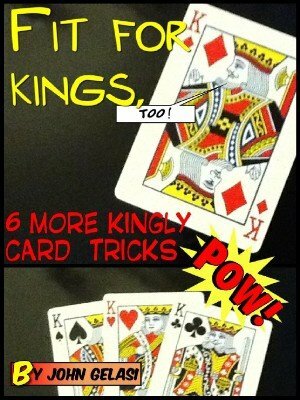 Kangaroo Kings: A completely self-working packet trick where the spectators find three of the four kings, and the last king is found by the magician in a totally unexpected way. All of these effects come fully explained. Each effect comes complete with an HD-shot video demo, as well as photo illustrations to make learning these fun effects a breeze.